Rated 2" white swing check valve. NO SPRING, NO METAL. Must be orientated a certain way for it to close properly. 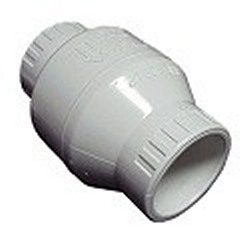 If you need a valve you can put in any position look for the spring check valves on this page. General Installation Information: Swing check valves are designed for horizontal installations, but may be installed in up-flow only vertical position. Check valves MUST be installed with the valve's FLOW arrow pointing in the direction of the flow. Do not install valve upside down. Flow velocity should not exceed 5 ft./sec. Minimum opening pressure less than 0.5 psi. Made in the U.S.A.